Nick Urata remembers his first gig in Kansas City – the band’s bus crashed right in front of where they were going to play, the Hurricane. 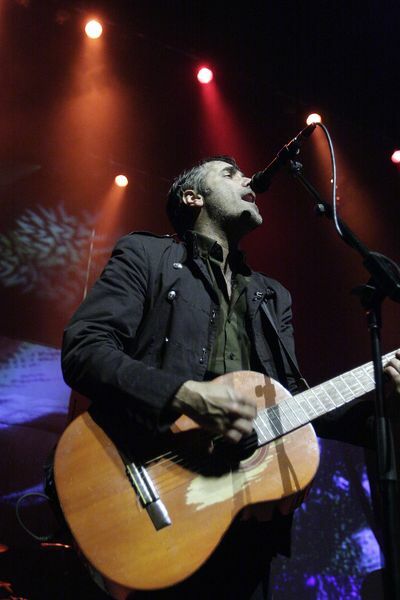 Devotchka – the name is Russian slang for “girl” – may be based in Denver, but their music covers the map, pulling in elements of mariachi, gypsy and French music and indie rock. The quartet’s theatric sound is built on layers and textures, much of it cribbed in the same Eastern European rhythms and energy used by Gogol Bordello, although Devotchka’s music is significantly less aggressive. The musicians’ versatility meant the sound could change dramatically from song to song. Concert opener “The Alley” drew in the crowd with its propulsive rhythms, courtesy of drummer Shawn King and percussion from touring member Mauro Refosco, a veteran of David Byrne’s band and Thom Yorke’s Atoms For Peace project. Later, Refosco moved to keyboards and King played trumpet to give “We’re Leaving” a South-of-the-border feel. Of all of the high-caliber musicianship onstage, however, Urata’s singing was easily the most impressive instrument. His powerful tenor always hovered over everything else onstage, always complementing the arrangements underneath. His articulate enunciation effortlessly unspooled the short-story-like quality of the group’s lyrics. Urata’s falsetto danced delicately with Hagerman’s violin on “Undone” and he displayed near operatic range on “We’re Leaving.” During the encore Urata pulled a page from vocal legend Freddy Mercury’s playbook and engaged the audience in an operatic call and response. Just like Queen at Wembly, Urata pulled it off flawlessly. Urata’s talents extended well beyond his esophagus, however. During “Poland,” Schroder bellowed a rare Sousaphone solo which Urata countered by playing the Theramin. During “Ranchero” he delivered a guitar solo that played off King’s drums like Tom chasing Jerry. Several screens behind the band displayed abstract images, sometimes superimposed with close-ups of a soloist, adding another layer texture to the presentation. Devotchka got a real-life assist during “Vengo! Vengo!” when two women came out and performed a fabric dance high above the stage. The dancers returned during “Contrabanda,” performing a shadow dance behind two of the screens. The duo performed in front of those same screens a few songs later, twirling umbrellas as a kaleidoscope of colors washed over them during “100 Other Lovers.” A subtle light show also enhanced the atmosphere. Setlist: The Alley;Head Honcho; Queen of the Surface Streets; Poland >The Clockwise Witness; The Man from San Sebastian; We’re Leaving; Vengo! Vengo! ; Exhaustible; All the Sand in all the Sea; How It Ends; Basso Profundo; Undone; Contrabanda; I Cried Like a Silly Boy; 100 Other Lovers; Mexican. Encore: Only Love Can Break Your Heart (Neil Young cover); Ranchero; You Love Me.